OLLI at CSU, Chico offers a cultural feast this fall celebrating a wide array of interests, including more than 125 courses ranging from literature, history, finance, social issues, and current events to science, meditation, foreign languages, hiking, and acrylic painting. The fall schedule also features a bus trip to the Legion of Honor museum in San Francisco following a lecture by artist and retired CSU, Chico art history professor Dolores Mitchell on the museum’s Degas, Impressionism, and the Paris Millinery Trade exhibit. 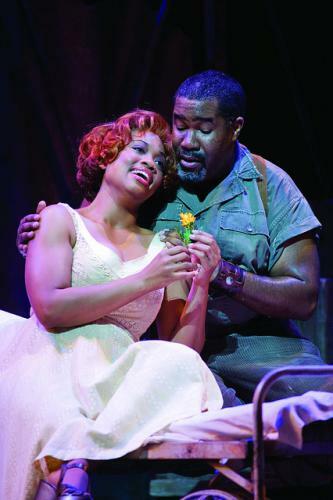 A partnership with Chico Performances adds a Story Corp Workshop with poet and performer David Gonzalez, as well as discounted tickets to a San Francisco Opera’s Grand Opera Cinema Series screening of The Gershwins’ Porgy and Bess. A number of classes will be led by current and former Chico State faculty and staff, including Robert Main’s examination of media coverage of current issues; a discussion led by Brooks Thorlaksson on this year’s Book in Common, “A Deadly Wandering;” a look at the history and culture of the Celts by Lynn Elliott; an opportunity to design displays in CSU, Chico’s Meriam Library with Librarian Donna Greenberg; and Marc Siegall’s exploration of the history of science fiction on television. In addition, this term features a selection of classes focused on the health – physical, mental, and fiscal – of seniors in our community. 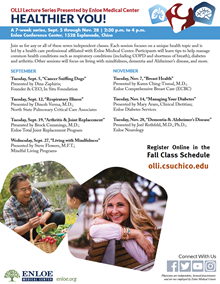 OLLI partners Enloe Medical Center and Altum Wealth Advisors are offering a “Healthier You” lecture series presented by physicians and other caregivers and a class on financial fitness for women retirees, respectively. Other classes include Avoiding the Crisis from Hospital to Home, Maturing–Evolving–Aging, Coloring for Seniors, and Optim-Eyes Life with Macular Degeneration. The fall class schedule is viewable online and members may take classes in any one of OLLI’s three locations this fall: Chico, Oroville, and Paradise. New and renewing members may join and/or pay membership fees, as well as sign up for classes, at any time during the semester. Registration is available online at olli.csuchico.edu, in person, or by mail. To receive mail-in registration forms, call the OLLI office at 530-898-6679. The Osher Lifelong Learning Institute (OLLI) at CSU, Chico will showcase their fall class line up at a pair of Open House & Class Preview events in Chico and Oroville. OLLI peer leaders will be on hand to talk about more than 125 courses ranging from literature, history, finance, social issues, and current events to science, meditation, foreign languages, hiking, and acrylic painting. The Chico Class Preview will be held August 10 from 10 a.m.–noon at Manzanita Place, 1705 Manzanita Avenue. The Greater Butte County Chapter event will be held August 15 from 1–3 p.m. at the Butte County Library Oroville Branch, 1820 Mitchell Avenue. Both events are open to the public. The fall class schedule is viewable online at olli.csuchico.edu. Members may take classes in any one of OLLI’s three locations this fall: Chico, Oroville, and Paradise. New and renewing members are encouraged to join and/or pay membership fees before class registration opens on August 17 at 9 a.m. Registration is available online at olli.csuchico.edu, in person, or by mail. To receive mail-in registration forms, call the OLLI office at 530-898-6679.